I like action books, and I like murder mysteries – so combining them seemed obvious. This is the first book of a series of 5 – the first two are out now and the others will follow over the next two months. I really enjoyed creating Valerie's life – she is a great role model for girls who want to be more than 'a traditional female'! I usually get a plot idea, sit down to capture it, and have the characters almost create themselves as I do. these books were no different. Valerie Inglewood held her rifle out of the dirt and crawled behind the bunker. She wedged the rifle into her shoulder and took careful aim at the man hiding behind the bush. The crackle of gunfire echoed from the other side of the woods and set her nerves on edge. Were her comrades alive over there? She couldn’t think about them right now. She steadied her breathing and inched her finger closer to the trigger. The man jumped three feet into the air when she pulled the trigger. Her rifle jammed against her shoulder, but she ignored the pain and steadied her weapon. The man whirled around, but before he could get his own weapon into position, Valerie fired again. The shot hit in square in the chest, and he toppled backward into the dirt. Valerie choked on the dust when she slithered forward and crouched over his prostrate form. Yes, he was well and truly dead. She caught sight of a string of camouflaged shapes slipping through the trees. Were they her friends, or were they enemies? All at once, an air horn sounded behind her. She sat back on her heels and poked the man on the ground in the ribs. They stood up together and slapped each other on the back. Then they strolled back across the course to the locker room. 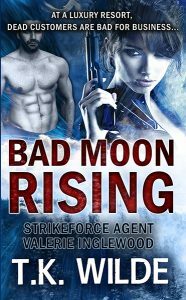 Valerie hung up her fatigues and helmet and set her rifle in the locker. “None that I know of,” Valerie replied. Rex started to say something else when a tall woman with flaming red hair hanging down her back stepped into the locker room. Snake skin cowboy boots showed under the hems of her tight blue jeans. “Charlene Brockworth!” Rex obviously knew her…. “But that’s all the way up near the Wyoming state line,” Valerie replied. Valerie exchanged glances with Rex, but Charlene was already out the door and around the corner out of sight. Valerie grabbed her duffel bag and hurried after her. Charlene led the way to the parking lot. “Is that so bad?” Charlene asked. “I wish I had known,” Valerie murmured.